Big Hairy Audacious Goals. 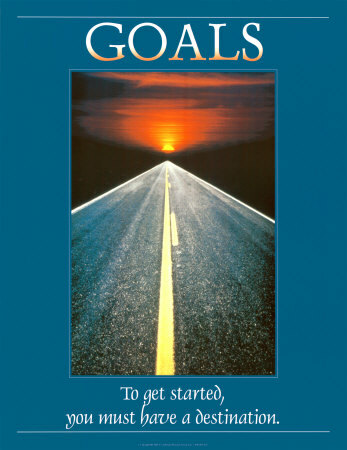 We often coach and coax our clients towards setting these goals for themselves - the ones that alternately excite and scare them - and then we coach them through breaking down these goals into things that they can actually do. One recent client knew what she wanted - that was very clear to her. However, whenever she set out her goal she found herself nearly running in the other direction. It seemed too big, too scary, too insurmountable, and instead of taking a stab and failing, she would give up before she even gave it a go. As a team of two we sat with her goal...and broke it down into small, doable steps. One day all she had to do was make a list; the next day her task was to make three phone calls. Each day she had a job, a task - something that seemed entirely possible to her. It might be a challenge, but still she could see that she could do it...and that by accomplishing each of these actions steps she would move, albeit slowly at times, towards her goal. What we want, in the long run, might seem Big, Hairy, and Audacious. However, when we take this desire and chop it up into small bites that we can accomplish, we find ourselves moving towards our final destination. That's the secret. Where are you frozen by the hugeness of what you're trying to accomplish? How can you break it down into manageable pieces? Set your BHAG – and break it down into smaller bits that you can do. Now do them.